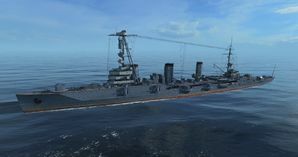 Krasny Krym — Soviet promo premium Tier V cruiser. A light cruiser designed in the 1910s and armed with multiple main guns of a relatively small caliber. By the end of World War II she underwent an upgrade to obtain powerful AA defense and an improved gun fire control system. The ship, however, was inferior to her contemporary ships in speed. Krasny Krym was first released for sale on 18 July 2016 for the NA server and 16 July 2016 for the EU server. Krasny Krym is a Tier V Russian cruiser that is similar to Tier IV sister-ship Svietlana in many ways, except she is up-tiered to Tier V. It's unfortunate, then, that she is relatively weak when compared to the other Tier V cruisers. Her guns, while adequate at Tier IV, are underpowered at Tier V unless shooting destroyers; with her large detection radius, however, she will have a hard time getting into range of destroyers in order to shoot them. Her torpedoes only reach out to 5.0 km and she has but one triple launcher per side, making them more of an afterthought than a viable weapon. Though they can get a bit of last ditch damage on somebody, don't expect them to save her versus something with a lot of HP at close range. Krasny Krym is a great ship play behind islands to save her hitpoints for the late game. She can further such a strategy by training Basic Firing Training and Advanced Firing Training on her commander. Another option is to set her up as a destroyer flotilla leader and sail close to friendly destroyers to provide them with fire support against enemy cruisers and destroyers. An 130mm main battery which can take advantage of Basic Firing Training, Expert Marksman, and Advanced Firing Training commander skills. Smallest turning radius of all Tier V cruisers. Excellent torpedo firing arcs as well as longer range than most Russian torpedoes around her tier. Poor turret traverse for 130mm main battery. Fairly slow rate of fire. Second lowest HP of all Tier V cruisers. As a Premium ship, Krasny Krym doesn't have any upgrades to research. As a Premium ship, Krasny Krym comes included with Type 9 camouflage that lowers her detection radius, reduces the accuracy of incoming shells, reduces her repair costs, and increases the amount of experience she earns. A Krasny Krym sails past its fallen adversary - a Farragut-class destroyer. Krasny Krym prepares for departure alongside a friendly Texas-class battleship. The Krasny Krym unleashes a full broadside against an enemy Königsberg-class German cruiser. A Krasny Krym duels a Sims-class destroyer, eventually winning the engagement. Flag of Krasny Krym. Given to players who purchased a special bundle containing Krasny Krym. Krasny Krym (Russian: Красный Крым; translation: "Red Crimea") was a light cruiser of the Soviet Navy. She was laid down in 1913 as Svietlana for the Imperial Russian Navy, the lead ship of the Svietlana class. She was built by the Russo-Baltic Yard in Tallinn, Estonia and launched in 1915. Her hull was evacuated to Petrograd when the Germans approached the port in late 1917 and laid up incomplete during the Russian Revolution. The ship was completed by the Soviets in 1926. During World War II she supported Soviet troops during the Siege of Odessa, Siege of Sevastopol, and the Kerch-Feodosiya Operation in the winter of 1941—42. Krasny Krym was awarded the Guards title on 18 June 1942. The ship was reclassified as a training ship in November 1954 before being scrapped in July 1959.